By Zack Quaintance — I love any month wherein indie publishers sweep our top five best new #1 comics list, and this is (obviously) one of those months. I’m not sure how often this happens, but it’s always a treat. This month, simply put, brought one of the best crops of new creator-owned debut issues I’ve ever seen...two of which were even by the same writer! What’s also great is the diversity of publisher among our top 5 best new #1 comics of August 2018, with books coming from usual suspects like Dark Horse and Image, and from other sources too, including AfterShock Comics, Scout Comics, and IDW’s Black Crown imprint. Yes, not only do we have a top 5 consisting entirely of indie books, we also have a list that features five different indie comics publishers! The state of comics is strong, friends, strong indeed. We are truly lucky to be fans of this storytelling medium in such exciting times. Now then, let’s get to the list! It's been a while since I've enjoyed a big Marvel event as much as the first two issues of Infinity Wars, both of which came out this month. I attribute this to killer Deodato art and an increasingly strong overall state of affairs within the Marvel Universe. The DC/Looney Toons specials were a delight, yet again. The Lex Luthor/Porky Pig Special #1 and the Catwoman, Tweety, & Sylvester Special #1 don’t hit Batman/Elmer Fudd levels of greatness, but they’re both quite good. In my Extermination #1 review, I wrote about liking it because it seemed like minor cleanup of X-continuity in preparation for November’s relaunch of Uncanny X-Men. If that’s what this series ends up being, count me in for all five issues. After what he did with Mike Allred in Silver Surfer, Dan Slott has 100 percent of my trust when it comes to nailing the family dynamic at the heart of the Fantastic Four. The first issue did nothing to change that. 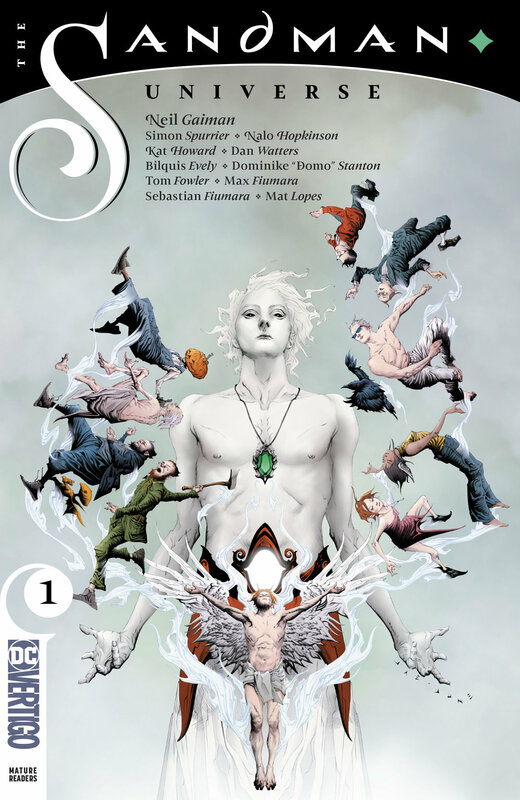 I’m currently working my way through the original Sandman for the first time (I know, I know), one issue per night, and the reason why is because I found the Sandman Universe #1 teaser issue so intriguing. I loved Matt Kindt and Tyler Jenkins’ recently-concluded series Grass Kings. They’re back now, with a completely new book, Black Badge, and I’m all in. Read my review of Black Badge #1. I have a new rotating gig writing the DC Round-Up for my favorite comics website, The Beat, and I got Pearl #1 with my first crop of books...and I loved it! Read my first DC Round-Up, in which I discuss Pearl. Cold Spots #1 was appropriately chilling, promising more horror to come and living up to its title. Leviathan #1 is one of those new books that brings together a creative union so perfect it seems like it's been going on for years. West Coast Avengers #1 is a perfect use of every character in it, and a natural evolution of this franchise. I’m glad it exists. As someone currently working a full-time job, plus three other work-for-hire writing side gigs that involve logging keyboard time fairly regularly at all hours (nights, weekends, etc. )...this late capitalist horror story about a young woman targeted by a crowd-sourced assassination app who subsequently contracts a defender via another separate app...well, it hit close to home for me. My own economic and professional perspectives aside, Crowded #1 is simply a well-done comic. The pacing spares no tension, giving us just the right amount of info before throwing us into rapid action, and the bits Sebela and team reveal about their two lead characters are equal parts relatable and fascinating. What this book excels at most, however, is emphasizing the absurdity of what it’s like to work in 2018, extending the gig economy to a logical-yet-horrific extreme that should make every reader afraid, or at least introspective the next time they call an Uber. Hot Lunch Special, as I’ve said on Twitter, blends a generational American immigrant story with Midwestern crime noir evocative of Fargo. The result is a comic unlike any other on the stands today. Essentially, you come to this book for the mafioso murder/extortion plot line, and you stay for the touches of sincere graphic memoir—or maybe vice versa. Even with severed appendages inside sandwiches appearing pretty near the story’s start, it’s to Hot Lunch Special’s credit it feels understated, as a good Midwestern story should. This is due in large part to the impressive work Rahal and Fornes do building character, particularly with the younger members of the family. An organized crime story is just so much more compelling when you start to tangle up those who are born into it, who maybe don’t realize the extent of the dirt and certainly didn’t ask for it. Rahal and Fornes know this well, and it makes for a great comic. Annnnnd here we have another entry from writer Christopher Sebela, this time via IDW’s en fuego Black Crown imprint, which landed a book in last month’s Best New #1 Comics with another favorite of ours, The Euthanauts. The hits will likely keep coming for Black Crown too, what with the Laphams rolling out a crime noir book this fall about a nefarious shape-shifting travel blogger (I know, right?! sounds amazing). But I digress. 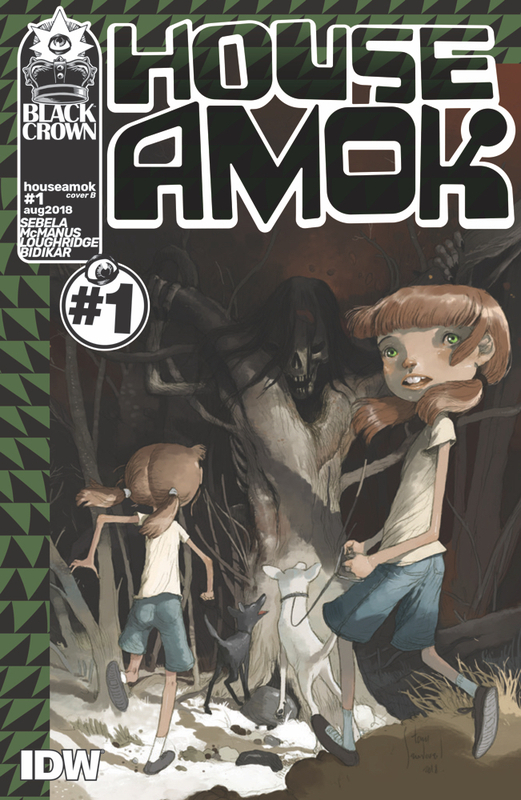 House Amok is visually rich with the work of veteran artist Shawn McManus, colored so effectively here by Lee Loughridge, one of the industry’s best at using different tones to establish flashbacks and mood. In addition to the stellar art, Sebela deploys a precocious narrative voice, a child writing about her literally crazed family in an innocent diary, trying to parse her own little healthy reality amid the violence the older relatives she’s supposed to trust continue to justify are perpetrate. Lyrical and dark, I’m all in on this comic. Speaking of lyrical and dark, our next new #1 is more of a continuation than a pure debut, but we like it so much we had to include it. And, hey, isn’t more of a continuation than a pure debut an accurate summation for nearly every new superhero #1 of the past two or three decades? Anyway, Long Lost is everything that’s healthy about indie comics right now rolled into one brilliant sequential graphic story. In this book, readers find experimentation with form, effective-yet-subtle visuals that convey mood, patient characterization, and ideas that are mysterious and haunting. By design, much of the nature of this book is still to be revealed, yet the ride we’ve been on now through seven total issues has been thoroughly engrossing, incorporating ideas about the past, moving on, and sisterhood. Do yourself a favor: find and binge every issue of this comic. And do it while spending a long and quiet weekend somewhere, nostalgic and alone. Ann Nocenti and David Aja’s Seeds #1 is the type of comic that will bug your eyes, expanding your consciousness and giving you occasion to slow down and run your hand over its pages and pages of stunning and provocative visuals. This book is probably best classified as near-future science fiction, a genre thriving in comics right now. Something about Seeds, however, feels different; as if these creators were given an actual glimpse of a future, complete with logical societal changes that are as of now impossible to predict. Maybe that’s what makes Seeds feel so obviously brilliant—its world feels realistic, yet very much the product of the creators’ minds, sharp and visionary as they are. This is a four-part series, and after one issue I’m unequivocally on board for all of it. Nocenti and Aja are both towering talents who’ve contributed seminal works to mainstream superhero comic books, and now they’ve gone off-map. Be excited and afraid. Crowded #1 is a much-hyped comic that does not dissappoint. By Zack Quaintance — Crowded #1 is, to put it simply, a super-hyped book, one of those comics that got a movie deal (with Rebel Wilson attached!) before its first issue saw release. It also has a notable and rising creative team (writer Christopher Sebela of Cold War, Shanghai Red, and artists Ro Stein and Ted Brandt, who’ve done cool stuff with Marvel, to say nothing of Triona Farrell, who’s absolutely great). As such, I came to this book with a mix of excitement and high expectations—and I was thoroughly and utterly hooked from basically the first page. Crowded extrapolates the gig economy to its natural and excessive capitalistic extremes, to a place wherein anything you could ever need is accessible via the gig economy or a social connections app. In the world of Crowded, our protagonist Charlotte works 12 for-hire jobs in one day (on a slow day), ending the first night we see her by hooking up with a man she meets via another app, with whom she never needs to so much as exchange real names. When people start trying to kill Charlotte en mass the following day (via a crowdfunded death app), she hires a bodyguard via yet another app, this one called Dfend, and our plot is off and running. That’s really all I’ll say about Crowded’s story, since the inner machinations of this book are such a joy to unfurl. Solid plotting aside, this creative team does a wonderful job peppering their book with the little touches that do work to keep readers engaged (things like the mysterious bodyguard's personal life/motivation, Charlotte’s pithy rejoinders, an adorable chihuahua, etc.) and make good graphic sequential storytelling so enthralling. In addition, the storytellers use a workmanlike precision to accomplish the required exposition and world-building, as if they themselves had been materialized by an on-demand app for great creators. Yeah, it’s all that entertaining. Crowded at its core, though, is about a dystopian future that should feel too real to us all, a vivid imagining of a likely scenario to come, steeped in a plot that feels as dangerous, urgent, and tense as vintage Tarantino.